They're giving away 1,000 DealCows each day through Friday 8/9! That's 5,000 total Cows that will find a new home and one could be yours. 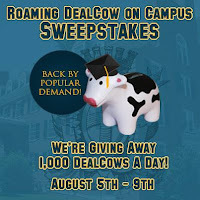 *Rules* Registration: From 8-5-13 at 12 PM CT to 8-9-12 at 9:59 PM CT, visit Facebook click on the "Roaming DealCow on Campus" link, and follow instructions to "Like" CowBoom, and complete Registration Form. Limit 1 Registration per eligible person. Registration by groups is not eligible. Must have a valid Facebook account in order to enter. Facebook membership is free. Up to five thousand (5,000) prospective Entrants who complete Registration during the Registration Period (determined in daily drawings awarding 1000 DealCows/day) will be mailed via USPS one (1) DealCow to the mailing address provided in the Registration Form (odds of winning a DealCow depend on total number of eligible entries received in the drawing day). Three judged Photo Contest winners will each receive: One (1) Asus - 11.6" Touch-Screen Laptop - 4GB Memory - 500GB Hard Drive - Steel Gray Hairline [â€œARVâ€]: $429.99), One (1) AppleÂ® â€“ iPodÂ® 16GB â€“ 7th Generation â€“ iPod (ARV: $149.99), and One (1) $100 Visa Gift Cards (ARV: $100.00). Subject to full Official Rules at www.facebook.com/cowboom. Sponsor: Best Buy Stores, L.P., dba CowBoom, 7601 Penn Av. S., Richfield, MN 55423. This promotion is in no way sponsored, endorsed or administered by, or associated with Facebook.